Dynamic Digital Advertising is one of the earliest professional custom website designers and developers to institute a hybrid process for constructing organic websites integrated with search engine optimization methodologies for companies from all industry segments. Clients who utilize DDA's high-end website design process secure better rankings from leading search engines like Google, Yahoo, and MSN which results in thousands of targeted visitors every month. DDA-developed websites interest these visitors with highly-stylized design and organized menu structure both of which results to a pleasant user experience that helps transform visitors into customers. 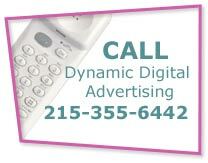 Dynamic Digital Advertising is a digital graphic design firm established in the greater Philadelphia are and specializing in graphic design for interactive CD-ROM and DVD, brochure and other print media, marketing and branding, digital video production, virtual reality, and more. Graphic design for branding and marketing by DDA offers a consistent corporate identity, ideal for new product launch. Depending on your companys promotional needs, branding and marketing tools can encompass digital photography, digital video production services, large format graphic design, CD-ROM/DVD, and many others. Dynamic Digital Advertising provides clients with one of the most comprehensive listing of digital marketing services in the country. Reduce your costs, increase your revenue, and improve communication with streaming video production services by Dynamic Digital Advertising. Streaming video offers broadcast-quality audio and visual available for distribution over Internet or Intranet websites. DDA’s high-end video studio takes clients through digital audio and visual recording as well editing, compression into streaming format. If you’re ready to reach more customers, partners, students, or investors, call Dynamic Digital Advertising, a leading custom website design company, to learn more about out streaming video capabilities. Recording corporate presentations with streaming video allows you to reach a broader audience. Financial meetings, for example, can be attended by all stockholders, regardless of their schedule or location, while members of affiliate or adjunct companies can sit on meetings taking place on the other side of the country. As business becomes increasingly global, many corporations are making presentations to more clients, more investors, and more affiliate companies. Dynamic Digital Advertising can provide streaming broadcast-quality footage of your professional website through Internet and Intranet websites. Distance learning is increasingly popular as more non-traditional students matriculate and companies expand their employee base. Students can attend classes or training sessions that are compatible with their schedules by visiting your website, and additionally, can replay the information to maximize retention. DDA records, compresses, and uploads lectures or training seminars. Dynamic Digital Advertising can shoot in-house or go on-location to record a live lecture or training sessions in a conventional setting. Visual and audio media is more powerful than written instructions or black and white diagrams. Streaming videos that detail how to benefit from your company’s products or services are readily-available to customers who visit your company’s website. If your development team predicts that assembling or operating a product may prove difficult for customers, streaming video provides the visual solution that both you and your customers need. The professional videography team at Dynamic Digital Advertising can record products, systems, or processes in-house and on-location. Streaming videos incorporated into a custom website design present a company that is technologically-advanced as well as professional. As Philadelphia’s leading custom website design and professional website development company, Dynamic Digital Advertising understands the importance of impressing your website visitor. The videography team works with the website design team to successfully include streaming video that is viewable by every website visitor regardless of their platform, web browser, or server. video production services can benefit you.